Approximately 37 miles south of Cancun, and a hop, skip and a jump from Playa del Carmen sits Xcaret, arguably Mexico’s best eco-archeological park and a destination in its own right. One could spend days and still not experience all there is to do there. Have a close encounter with the largest cat on the American continent. In Mayan culture, the jaguar symbolized war and power and was associated with the night. That same sense of power and otherworldliness can be felt by visitors today as they visit the jaguars’ territory. In pre-Hispanic times, Aztecs believed that butterflies represented the souls of warriors who had lost their lives in battle. Today, the entire family will love exploring this natural area, where more than 20 species of butterflies flit and float among the tropical foliage. Xcaret is home to a marine turtle conservation area, which focuses on teaching visitors all about these fascinating sea animals. Interestingly, six of the seven species of marine turtles in the world nest on the coast of Mexico—four of them in Quintana Roo. Sit back and relax as you drift down the river, taking in the unique flora and fauna of the area. Be on the lookout for such local residents as blue crabs, peccaries and iguanas. Get a glimpse into the daily life of the Mayans as you journey through this village and see how they built their homes, what they ate and how they went about their lives. The journey takes you through caves, paths and bridges as visitors learn about ancient Mayan crafts from present-day artisans. Below the Yucatan Peninsula lies a natural network of rivers and caves. 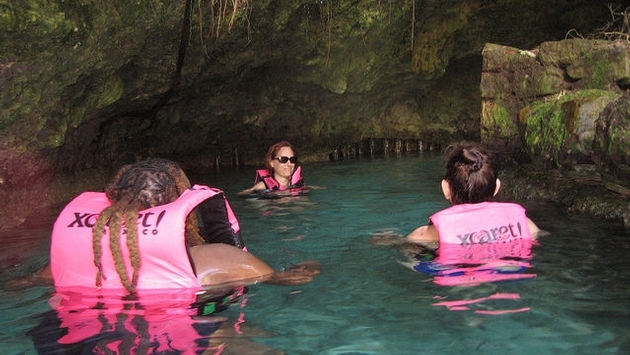 Visitors to Xcaret can have the thrill of a lifetime as they explore these natural wonders. Guests can explore the Blue River, the Maya River or the Manatee River, all of which make their way to the ocean past mangroves and pink flamingoes. No visit to Xcaret is complete without seeing this renowned show, which takes the audience through the history of the region, starting with pre-Hispanic times through the present. Dazzling costumes and blazes of color bring the history and legends to life. Shows begin at 7 p.m. This ritualistic ceremony dates back to the Mesoamericans when four “flyers” and a musician would climb a pole to pay tribute to the sun, the four winds and the cardinal points. Today, the ceremony continues and is considered an Intangible Cultural Heritage of Humanity by UNESCO. Parents will be excited to discover that Xcaret offers a world just for the junior set. Designed for kids up to 12 years old, Children’s World is one of the newer attractions and boasts such fun activities as hanging bridges, water slides, tunnels in which to explore and, for the smaller set, a wading pool, sandbox and splash pad. Best of all—there’s a waiting area for parents.